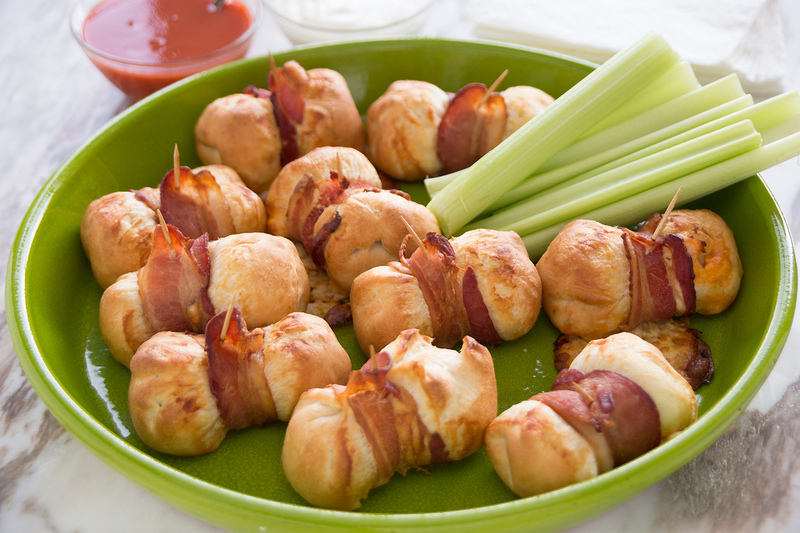 These delicious appetizers will be a hit at your next gathering. Spray counter lightly with non-stick cooking spray. Flatten each roll into a 5 inch circle. Combine chicken, buffalo sauce, dressing and celery. Divide filling evenly between the 20 circles, placing a mound in the center of the circle. Place 1 cheese piece on top of filling. Pull dough up to enclose filling and pinch together to seal. Wrap a slice of bacon around each bundle and secure with a toothpick, pinched end up. Place on sprayed baking sheet and bake at 350 degrees F 15-20 minutes.